PIKEVILLE, Ky. (Dec. 6, 2017) – Beneath the picturesque backdrop of the storied Appalachian Mountains, progress continues at Alltech’s Dueling Barrels Brewery & Distillery in downtown Pikeville. 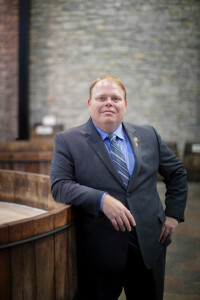 Marking the latest milestone, Eastern Kentucky native Danny Branham has been appointed general manager, overseeing the region’s first (legal) bourbon, beer and moonshine operation. Branham has been with Alltech for nearly eight years, often traveling far from his hometown of Pikeville. At Alltech’s facilities in Tianjin and Beijing, China, Branham was instrumental in streamlining quality and production processes. He also earned his master’s degree in brewing and distilling from Heriot-Watt University in Scotland. Since returning to the U.S., Branham has served as quality manager for Alltech’s beverage division. “I think what I am most excited about is the opportunity to return home and be involved in a project that will put Pikeville on the map as one of the premier destinations in Kentucky to visit and experience the art of brewing and distilling,” said Branham. In addition to distilled spirits, Dueling Barrels will offer visitors a taste of rich Appalachian culture as they explore stories of mountain music, family feuds and the resilient immigrants who shaped the region. Dueling Barrels is the latest endeavour in the continued global expansion of the Alltech Beverage Division. Alltech founders Pearse and Deirdre Lyons feel a special kinship with the mountains, craftsmanship and hardworking people of Appalachia. After immigrating to Kentucky from Ireland, they developed a strong affinity for the region and sought an opportunity to invest in its development. It is their hope that the distillery destination will extend the Kentucky Bourbon Trail® tour into Eastern Kentucky. “Dueling Barrels has the potential to bring in lots of visitors to the area and increase revenues for all businesses through tourism,” said Branham. The next milestone will be the commission and operation of the brewhouse and distillery, slated for Jan. 2018, which will keep Dueling Barrels on track to open in spring 2018.